Since February is Ladder Safety Month, in this article we will discuss the proper techniques in using a ladder to ensure the safety of everyone. A ladder is a vertical structure with a number of steps or rungs used in working on high areas that are difficult to reach. They can be made of different materials such as wood, metal, or rope. Ladders are most often unsafe due to improper use and setup. Injuries caused by ladders range from minor ones (such as cuts or bruises) to major ones (such as broken bones or death). In fact, 160,000 people are hurt every year from ladder falls caused by not adhering to proper techniques of using a ladder. And worse, 300 deaths are recorded every year due to these ladder falls. 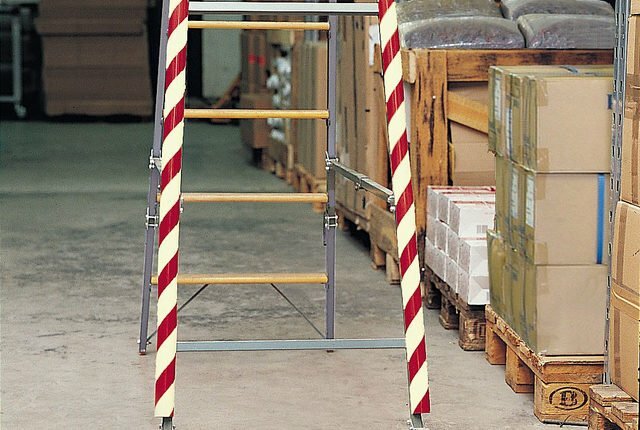 Work site environment – Choose a type of ladder material (such as aluminum or fiberglass) depending on the environment where the ladder is being used. For example, if there are possible electrical sources around the work area, an aluminum ladder should not be used as it is a good conductor. Total weight – To calculate the total weight, sum the following: your weight, the weight of your clothing, equipment & supplies required, and the weight of any tools and supplies that will be placed on the ladder. Once the total weight has been calculated, check the ladder duty ratings and make sure not to exceed the maximum capacity. Ladder size – Ladders are available in varying lengths so it’s essential to make sure that you use the right length of ladder for your task because it is not safe to use one that is too long or too short. Also, stepping on the uppermost rung of a ladder for extra reach may cause you to lose your balance and fall. Before climbing a ladder, it’s important to inspect the ladder and the surrounding environment to ensure safety. Check the ladder from the bottom, moving up. Inspect each rung and their connections, fittings, accessories, locks and other parts. Inspect for fractures, sagging or splits. Check the bolts, rivets, and pivotal connections. Consider making a ladder inspection checklist, especially if you’re using ladders at a workplace. Don’t forget to put a label or tag on damaged ladders. Properly setting up a ladder will greatly reduce risks of injury. Clear the area from obstructions or other possible hazards. If a door is nearby, block it or lock it. Do not set up the ladder on an uneven surface. Set up the ladder with the correct angle. To do this, set up the ladder base 1 foot away from the wall for every 4 feet of the ladder’s length. Follow any other instructions or specifications set out by the manufacturer. It’s important to avoid common factors such as haste, sudden movements, lack of attention and improper footwear. To avoid falling off a ladder, proper usage of the ladder is necessary. Do not move the ladder while on it. Do not lower or lengthen a ladder while on it. Do not leave a ladder unattended. Do not let two people use a ladder at once unless it is designed to do so. Proper maintenance is essential to any piece of equipment to keep it safe and lasting as long as possible. Regularly clean the ladder and lubricate any movable parts. Remove any accumulated dirt or grime. Keep the ladder properly stored away from extreme temperatures.